LEGO Star Wars Republic Gunship features 4 ball gun turrets with space for minifigures, flick missiles, 8 top-mounted flick missile launchers, side and rear doors, swoop bike and a lifting handle…. Race to Geonosis in the awesome LEGO Star Wars republic gunship to rescue Obi-Wan Kenobi, Anakin Skywalker and Padme Amidala before they’re overpowered by two Super Battle Droids! Aim the gun turrets with minifigure cockpit, then open the front compartment to grab the flick missiles and restock the eight top-mounted launchers! LEGO model number: 75021: Open the side and rear doors to deploy the swoop bike! Use the lifting handle for easier flying-action role-play! Includes Obi-Wan Kenobi, Anakin Skywalker, Padme Amidala, a Clone Trooper Captain, a Clone Trooper, 2 Super Battle Droids, 2 lightsabers, a blaster pistol, a blaster and a blaster rifle. For ages 9 years and over; EAN: 5702014974753. WARNING(S): Not suitable for children under 3 years old. To be used under the direct supervision of an adult. 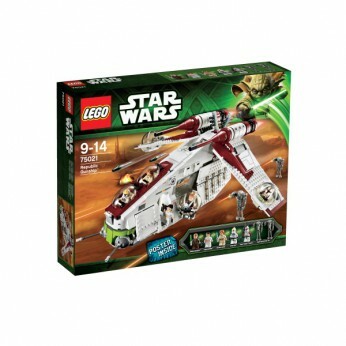 This toy costs approximately £89.99 (for the latest and best prices make sure you check our retailer list for the LEGO Star Wars Republic Gunship 75021 above). In our review of LEGO Star Wars Republic Gunship 75021 we classed it as being suitable for ages 6 years, 7 years, 8 years but recommend you check the manufacturer specific advice before purchasing.